Jeff Kellem and Peter Gannushkin photo credit left to right. Prolific Chicago-based saxophonist Dave Rempis (Rempis Percussion Quartet, Ballister, Rempis/Abrams/Ra, The Engines, Rempis-Johnston Ochs Trio) will present a set of new and developing solo pieces as part of his sprawling solo journey around the United States and Canada, taking place from April 16 thru June 26, 2017. He will be joined by the rarely heard Scott Walton – Tim Perkis Duo, a duo of Walton on piano and Perkis on electronics. Their newly released CD will be featured at the show! Saxophonist, improviser, and composer Dave Rempis has been an integral part of the thriving Chicago jazz and improvised music scene since 1997. With a background in ethnomusicology and African studies at Northwestern University, including a year spent at the University of Ghana, Rempis burst onto the creative music scene at the age of 22 when he joined the well-known Chicago jazz outfit The Vandermark Five. This opportunity catapulted him to notoriety as he began to tour regularly throughout the US and Europe, an active schedule that he still maintains to the present day. At the same time, Rempis began to develop the many Chicago-based groups for which he’s currently known, including The Rempis Percussion Quartet, The Engines, Ballister, Rempis/Abrams/Ra, Wheelhouse, Triage, The Rempis/Rosaly Duo, and The Rempis/Daisy Duo. Other collaborations have included work with Paul Lytton, Axel Dörner, Fred Anderson, Peter Brötzmann, C. Spencer Yeh, Hamid Drake, Steve Swell, John Tchicai, Roscoe Mitchell, Kevin Drumm, Paal Nilssen-Love, Nels Cline, and Joe McPhee. Rempis has been named regularly since 2006 in the annual Downbeat Critics’s Poll as a “rising star” on alto saxophone, and as a “rising star” and “established talent” on baritone saxophone. In 2013, he started his own record label, Aerophonic Records, to document this ongoing work. Rempis’ musical expression draws on a number of touchstones. While heavily improvisational in nature, his Greek ethnicity, studies in jazz and ethnomusicology, an appreciation for the philosophical underpinnings of contempory composition, and a love for unforgivingly strident yelps, screeches, and squeals that can encompass the ever-evolving state of human depravity all inform his work. Aside from his role as a musician and composer, Rempis has worked tirelessly as a presenter. Since 2002, he’s organized and produced a weekly series of improvised music at Chicago’s Elastic Arts Foundation. He was a founding member of Umbrella Music, and one of the lead producers and curators of its annual festival in Chicago from 2006-2014, and served as the business manager of the Pitchfork Music Festival from 2005-2016. He currently works with the Hyde Park Jazz Festival. For more information on Dave or this solo project, please check out daverempis.com. To check out Dave’s most recent recorded output, check out aerophonicrecords.com. And feel free to contact us with any questions at info@aerophonicrecords.com. 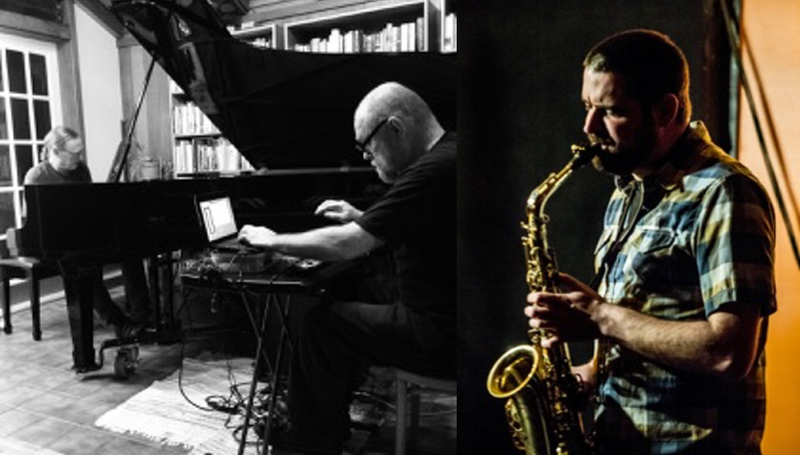 A duo from veteran improvisors Tim Perkis and Scott Walton; their music ranges from the exquisitely quiet to spontaneously energetic. Walton is better known for his in-demand contrabass playing, but his work as a pianist is not to be missed. Perkis plies his self-designed electronic improv instrument with sensitivity and agility. SCOTT WALTON is a bassist and pianist whose music negotiates the terrain between jazz, free improvisation, and the classical avant-garde. He has performed in festivals and venues throughout North America and Europe in a host of collaborative contexts, and has recorded with Alex Cline, Vinny Golia, Myra Melford, Steve Adams, Nels Cline, Tim Perkis, Michael Vllatkovich, Gilbert Isbin, George Lewis, Anthony Davis, and Bobby Bradford, among many others. TIM PERKIS has been working in the medium of live electronic and computer sound for many years, performing, exhibiting installation works and recording in North America,Europe and Japan. His work has largely been concerned with exploring the emergence of life-like properties in complex systems of interaction. In addition, he is a well known performer in the world of improvised music, having performed on his electronic improvisation instruments with hundreds of artists and groups, including Chris Brown, John Butcher, Eugene Chadbourne, Fred Frith, Gianni Gebbia, Frank Gratkowski, Luc Houtkamp, Yoshi Ichiraku, Matt Ingalls, Joelle Leandre, Gino Robair, ROVA saxophone quartet, Elliott Sharp, Leo Wadada Smith and John Zorn. Ongoing groups he has founded or played in include the League of Automatic Music Composers and the Hub — pioneering live computer network bands — and Rotodoti, the Natto Quartet, Fuzzybunny, All Tomorrow’s Zombies and Wobbly/Perkis/Antimatter. He has taught at the California Institute of the Arts (CalArts) and the California College of the Arts (CCA); has been composer-in-residence at Mills College in Oakland California, artist-in-residence at Xerox Corporation’s Palo Alto Research Center, and designed musical tools and toys at Paul Allen’s legendary thinktank, Interval Research. In 2013 he was a resident fellow at the Mediterranean Institute of Advanced Research (IMéRA) of the University of Aix-Marseille in France. His checkered career as a researcher and engineer has brought him a variety of interesting projects: creating data sonification displays for research physicists and biologists in France; designing museum displays for science and music museums in San Francisco, Toronto and Seattle; creating artificial-intelligence based auction tools for business; working on mobile phone based support systems for the blind; consulting on multimedia art presentation networks for the SF Art Commission and SF Airport; writing software embedded in toys and other consumer products; and creating new tools for sound and video production, research and analysis. Recordings of his work are available on several labels: Artifact,Tzadik, New World, Metalanguage, Rastascan, Limited Sedition, Kajira,482, Lucky Garage and Praemedia (USA); EMANEM, Leo(UK); Sonore and Meniscus(France); Curva Minore and Snowdonia(Italy); Pogriff(Canada); ALKU(Spain); XOR(Netherlands); Creative Sources(Portugal). He is also producer and director of a feature-length documentary on musicians and sound artists in the San Francisco Bay area called NOISY PEOPLE (2007), and the ongoing audio podcast NOISY PEOPLE (2015- ).